Sometimes I think I may have a small case of obsessive compulsive disorder. In this case, I fell in love with Fluffles the Cat stamps, and now I have about 12 of the little guy stamps. He kinda looks like my cat Dexter! 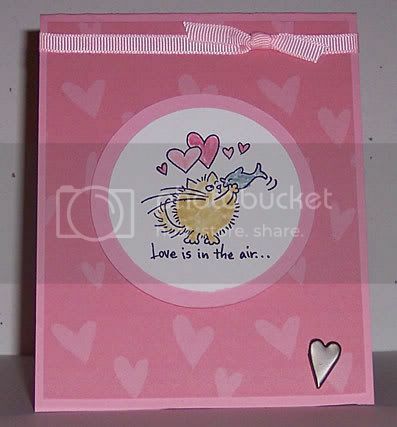 I made this card for my mom for Valentine's Day, and used the Fishy Fluffles stamp. It is so cute. The card is made with Pretty in Pink cardstock and the scrapbook paper background I downloaded from CreativeDelights.com. They have lots of high quality image files of 12x12 backgrounds for use in scrapbooking, although my printer has to clip down to 8.5x11. I thought that the rosy pink color went well with the Pretty in Pink. I almost went with Regal Rose but there was not enough contrast I believe. I stamped the image onto Whisper White and punched it out using the Marvy Mega Circle punch, and since I have had yet to get the Giga scallop circle, I used my new Coluzzle circle template to cut out the next biggest circle out of Pretty in Pink for a mat. I think I need to get the companion circle template because I'd rather there not be so wide of a mat. Can't wait to get my scallop punches! But I have to say, I was worried about being able to use the Coluzzle, but my goodness it was easier than I thought! Pretty cool tool. After I colored in the image with So Saffron for Fluffles, Bordering Blue for the fish, and Pretty in Pink/Regal Rose for the hearts with the SU markers, I mounted it onto the card with Stampin' Dimensionals. I tied light pink SU grosgrain ribbon around the top of the card and for something extra added a little pewter brad heart in the lower corner. I have really taken a liking to the 4.25x5.5 cards that open at the top. A bit different from what I'm used to!